Now I’m not going to join the bandwagon and frame it as the end times in education. We all make mistakes. Even one like this, as her staff did. Mistakes happen when we blurt things out without much thought. What is the purpose? Micro-blogging, or trying to communicate in 140 characters requires a different discipline (from say shouting, or firing off a press release). One needs to craft the message to the channel and its audience. 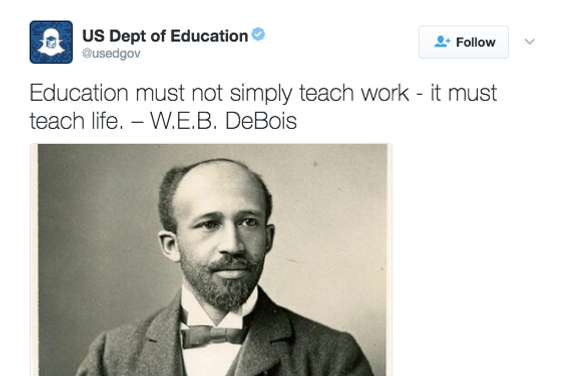 What was the point of the Education secretary’s Twitter handle being used to publish a quote from the essayist and author? Just to show that the department is clued up on sociology and civil rights? Come on! Does the Dalai Lama need to quote Gandhi to prove himself? Whose ‘voice’ is it? A department or an organization comprises many divisions. But the top dog sets the tone of voice. A random quote is quite an anemic way to communicate, since it basically reflects no one. Is the channel a news feed, or for insight into the workings of the organization? Is it a place to link to important assets, or ideas? It can’t be all things to all people. Define your brand voice! Who is doing it for you? Sure someone else may manage the communication, but you oversee it. Or, as some companies like Dell do it, set up multiple Twitter accounts for different constituents. This was something we discussed in 2009 and 2010. Perhaps government agencies shood should go back to Twitter skhool school. Or at laest least take communication 101.